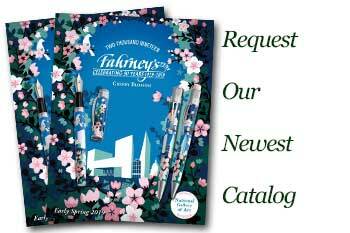 Order your Waterman Hemisphere Deluxe Silky Black Fountain Pen today from FahrneysPens.com. Fine Pens, Refills & Luxurious Gifts – great prices & fast shipping. Always one of our bestsellers, the Hemisphere is a favorite in fine writing and gifts for men and women around the world. Waterman added modern details and design upgrades to create the Hemisphere Deluxe Silk, slim and sophisticated pens that are ideal for every day and every occasion. Refinements include the polished palladium-plated cap and trim and the matte-black lacquer barrel etched with a subtle wave pattern. True to Waterman’s high-quality standards, you’ll get glowing results from the fountain pen with engraved, stainless steel nib, capped rollerball or twist-action ball pen. A perfect engraved gift for any occasion. Cartridge/converter fill.